Wiccan-Christians . . . does that work? An elder of my local Pagan community was pondering how someone can be a Wiccan and a Christian. To someone who isn’t straddling that particular spiritual fence, this can be every bit as puzzling as the Jews for Jesus are to most modern Abrahamics. As it happens I am neither a witch nor a worshiper of Jesus, but I think I can offer some thoughts on the question. 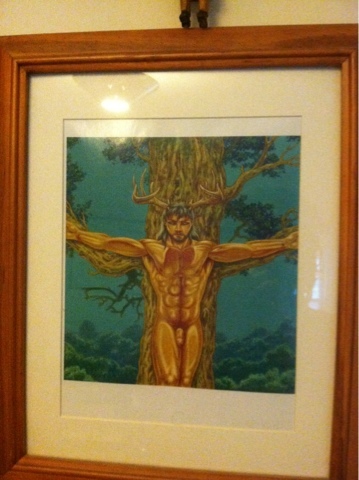 My first spiritual teacher had a print of Herne-Christos hanging over her altar. When she was just a little girl, she peppered her Baptist minister with complex questions about the nature of their god, and was finally instructed to pray to the Holy Spirit. Upon meeting with the preacher again, he asked if she had prayed for answers. That little girl was tossed out of her church community not long after, and although bereft, she clung to her belief in female divinity and her desire to be a priest. (Years later, she discovered that the Hebrew word shekinah, which is often interpreted by Christians as the Holy Spirit, is grammatically feminine.) She eventually became a reasonably accomplished and respected priestess, but she really wanted to be a priest, and she never let go of her love for Jesus. She told me that Herne-Christos represents the sacrificial god, who must die so that his people may live. I’ve always found it to be a powerful image, and a natural for me as I transitioned from worshiping the Christ to praying to the Horned One. I don’t pray to either of those gods regularly anymore, but I keep the picture up. Love. Jesus preached it, and the Charge of the Goddess explains it. Rules against murder, stealing, and lying, and being a jerk. Not all Wiccans follow every Wiccan tenet, nor do all Christians embrace every one of the commandments. Catholics love graven images, don’t they? A conservative Christian is intractable and would not accept this syncretic faith as meaningful, but neither would a Dianic Wiccan. All religions have their fundamental beliefs, and people who prefer to follow them more strictly. But those are minorities, albeit rather vocal ones. I don’t see why this fusion is puzzling. If indeed all gods are one god, what’s so odd about a Wiccan worshiping Jesus?